Behind the lyrics, there is a storytelling that majority of us miss out. Behind the lyrics, there is a storytelling that majority of us miss out. I used to listen to music by just getting into the rhythm and never paid attention to the lyrics or even the storytelling. I think the majority of us do this and is okay because I did it too. But when I decided to go inside myself, I began to listen and understand the storytelling of the artist. We are all artist and we create our own rhythm and is up to us to decide how we play it out to the world. 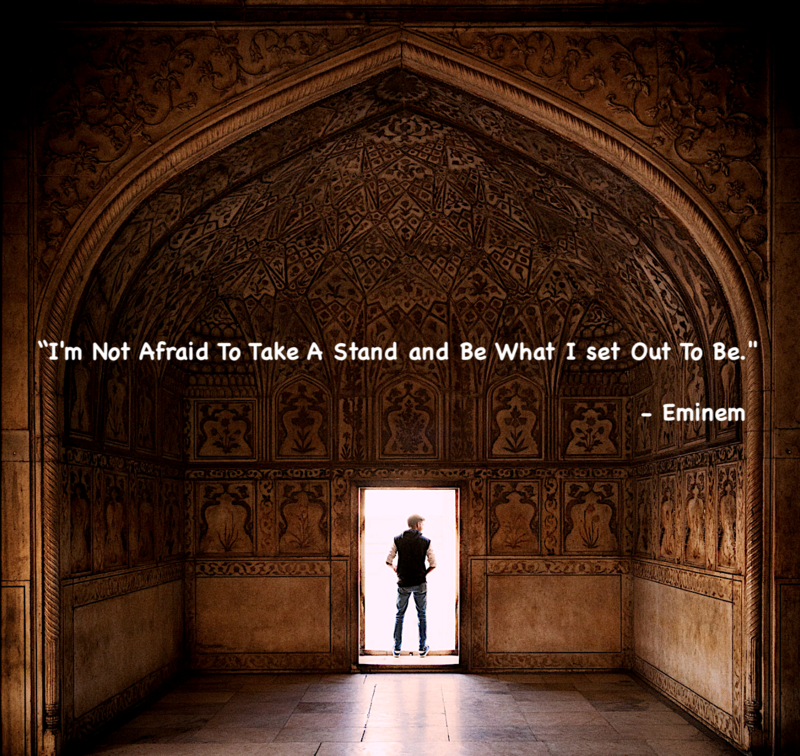 Eminem’s song “Not Afraid” touched my heart in my darkest time. One thing that I got from this song is to not be afraid. We should never be afraid to take a stand and be differential. We should never be afraid to decide that this is it and for you to take a stand and say to yourself, that never again you will go back to what you were. That now and starting today, you are breaking away from the cave. Eminem says in the song that you will face demons. The demons are your negative tendencies, negative habits which is karma. It is here when you battle against yourself. You will see here how strong you hold yourself in your darkest time. Without a physical guru or someone to mentor me in this part of my life, it took me some time to realize that I created all of the demons (fears, negativity, and everything that hold me back). Whatever self-transformation you have to make, it is an inside job. Eminem had a meltdown during the peak of his singing career and it is here when he wrote this song. Sometimes we think we have everything map out and later on find out that nothing can goes according to the plan. We should not die with regrets. If you die, at least die with the feeling that you did everything you can to turnaround your life. When I mentor people who are going through struggles, I always tell them to not feel alone because those who decided to take charge also went through this process. Every effort counts and without you noticing, something magical will happen along the way. This is the Universal Law of “Cause and Effect.” You put the effort and then it will come back to you. Never be afraid. Fear is the greatest enemy. But know that this enemy is only a thought and that is all. A real Lion is someone who faces his/her old self and goes face to face. It is here where you begin the breakdown your limitations. It is here where a new you will rise. There is a scene in the movie the Dark Knight when Bruce Willis is in the pit hole and is fear that keeps him stuck with no way out. Then he receives a wise advice: “The Only Fear is Fear Itself. Just make the jump and let Fear Will Not Find You Again.” In the back of his mind his thrive is to get out because many people are suffering and he feels the calling to go back out there and redeem himself. To let the lion inside of him Rise. Yes, Rise. Because we can all Rise even in the darkest time. Then he tries again to leave the pit hole with no rope, and this time is do or die. He is getting cheered by the inmates. Then right before he makes the jump, he stays focus and makes the jump without the rope. And there he is Rising outside the pit hole. He rises and behind him the Victory Castle the Mehrangarh Fort, Rajasthan’s Jodhpur, India. This fort represents Victory = Freedom. Making a self-transformational choice is not easy. It requires determination and a one focus mind. It is up to you to decide whether to remain in the status quo or keep going in search for that thing that gives you an inside spark. We all have the lion within waiting to come out. All of us have this potential. Just like all of us have the potential to reach enlightenment. Lord Buddha always said that achieving enlightenment is nothing special and he should not be treated like royalty because we all have this potential, we just need to dig it out. Don’t be afraid to take a stand. Whatever you are trying to get rid of that holds you back, just do it. Wake up every morning and say “Is Not Over Yet” and keep going. Make a “Promise” to yourself that you will never go back the old ways. I had many moments when I was doing austerities in the Himalayas, eating small meals with limited water and food and still doing severe yoga practices and climbing mountains. I lost a tremendous amount of weight, I spent many days dehydrated, I couldn’t sleep for weeks, my body ached, I began fasting, I walked dizzy many days and nights, and there were times when I heard voices to just let it go and this is all crap. Sometimes, I cried because my body ached so much. I remember climbing the steep hills and the mind is just pouring negative thoughts. But one thing that kept me going is that I made a “promise” after I had a fall down in New York City — That there is “No Way, I will go back to what I was.” Either, the mind throws everything at me and ends my life here in the Himalayas, or I just keep going to see what will happen. Honor the life you are creating. Honor every second you breathe. Honor the choices you make. Take a stand as there is nothing to fear. In the end, fear is just a thoughtttttt…. Former Senior Public Executive with experience working in government, social impact, and international development in the Middle East, Asia, Latin America, and Eastern Europe. Author and founder. Enjoys exploring the unknown and welcomes the unexpected to discover new blue oceans. Why do so many people miss out on their dream jobs?